The other day I was having a drink with my friend Alabaster. You might have heard of him before, but if not, you’ve heard of his boss, Santa. Alabaster is a highly educated elf who is the Administrator of the Naughty and Nice list for more than five decades now. It’s been his responsibility to manage it since it was still a paper list. He’s known for moving the list to a computer. Last year he moved it to AWS DynamoDB. “What?! What do you mean, you lost some kids?”, I asked. “Well. Let me explain. The process is a little complicated. Migrating the list to AWS was more than just migrating data. We also had to change the way we manage the naughty and nice list. Before, with our own infrastructure, we didn’t care about the resource utilization we used, as long as the infrastructure could handle it. We were updating the list five times a minute per kid. At 1.8 billion kids that was just over 150 requests per second, constant, easy to manage. Bushy, the elf that made the toy-making machine, is the kind of person that thinks a half-full glass is just twice the size it should be. Bushy pointed out that information about whether a child was naughty or not and their location for Christmas was only needed on December 24th. He proposed that we didn’t need to be updating the information as frequently. So we made changes in how we updated the data. It was a big relief but it resulted in a spiky load. In December, we suddenly found ourselves with a lot of data to update. 1.8 billion records to be exact. And it failed. The autoscaling of DynamoDB mostly worked with some manual fiddling to keep increasing the number of writers fast enough. But on December 23rd we had our usual all hands on deck meeting on last-minute changes of behaviour for kids and no one was reacting to the throttling alarms. We didn’t notice until the 25th. By then some records had been lost, some gifts had been delivered to the wrong addresses. “Oh, thank goodness you didn’t literally lose some kids! But, oh wow. Losing so many kid’s trust and belief must have really impacted morale at the North Pole! That sounds incredibly painful. So what did you learn and how has it changed the process for this year?” I asked. “Well, the main difference is that we decoupled the writes. DynamoDB likes regular writes and can scale in a reasonable way if the traffic is not all peaks or increasing really fast. “That looks like an interesting way of smoothing a spiky load. Can you share an example?” I asked. “I can show you the lambda code; I’ve just been playing with it.” He turned his laptop towards me showing me the code. It was empty, just a process_event function that did a write to boto3. “Yes, we use zappa for it, so it’s mostly configuration, ” he replied. We paired at the conference hotel bar, as you do when you find an interesting technical solution. First, Alabaster told me I had to create an SQS queue. We visited the SQS console. The main issue was that it looks like AWS has a completely different UI for the north-pole-1 region (which, to be honest, I didn’t know existed). I already had python 3.6 setup, so I only needed to create a virtual environment with python -m venv sqs-test and activate it with . sqs-test/bin/activate. I changed the profile_name and aws_region to match my credentials configuration and also the s3_bucket and the event_source arn to match my newly created SQS queue (as I don’t have access to the north-pole-1 region). This code shows the data of the context and event on CloudWatch logs. Alabaster explained that I could have quick access using zappa tail. Then I can use it to write to the naughty-nice list on DynamoDB or to whatever system I want to limit the activity. Alabaster showed me the North Pole’s working implementation including how they had the throttling alarms setup in CloudWatch, concurrency configuration of Lambda on the lambda console (choose a function, go to the “Concurrency” panel, click “Reserve concurrency” and set the number to 1 – then increase as needed). While a burst of a million updates was handled with some delay, there was no data loss. I could see the pride in his face. Hoping everything goes well for him this season, and that all have a good Christmas, and a good night! Ed Anderson is the SRE Manager at RealSelf, organizer of ServerlessDays Seattle, and occasional public speaker. Find him on twitter at @edyesed. Jennifer Davis is a Senior Cloud Advocate at Microsoft. Jennifer is the coauthor of Effective DevOps. Previously, she was a principal site reliability engineer at RealSelf, developed cookbooks to simplify building and managing infrastructure at Chef, and built reliable service platforms at Yahoo. She is a core organizer of devopsdays and organizes the Silicon Valley event. She is the founder of CoffeeOps. She has spoken and written about DevOps, Operations, Monitoring, and Automation. Companies strive to attract customers by creating an excellent product with many features. Previously, product to reality took months to years. Nowadays, product to reality can take a matter of weeks. Companies can fail-fast, learn and move ahead to make it better. Data analytics often takes a back seat becoming a bottleneck. Athena behind the scene uses Hive and Presto for analytical queries of any size, stored in S3. Athena processes structured, semi-structured and unstructured data sets including CSV, JSON, ORC, Avro, and Parquet. There are multiple languages supported for Athena drivers to query datastores including java, python, and other languages. Let’s examine a few different use cases with Athena. Let us say you have a service where you store user data such as documents, contacts, videos, and images. You have an accounting system in the relational database whereas user resources in S3 orchestrated through metadata housed in DynamoDB. How do we get ad-hoc storage statistics individually as well as the entire customer base across various parameters and events? Why is S3 usage growing out of sync from user base changes? Do you know how your S3 bucket is being used? How many objects did it store? How many duplicate files? How many deleted? AWS Bucket Inventory helps to manage the storage and provides audit and report on the replication and encryption status the objects in the bucket. Let us create a bucket and enable Inventory and perform the following steps. Create buckets vijay-yelanji-insights for objects and vijay-yelanji-inventory for inventory. AWS generates report into the inventory bucket at regular intervals as per schedule job. Run queries as shown in Figure 5 to get S3 usage to take necessary actions to reduce the cost. Let’s say you are sending a stream of events to two different targets after pre-processing the events very differently and experiencing discrepancy in the data. How do you fix the events counts? What if event and or data are missing? How do you resolve inconsistencies and or quality issues? Event Forwarder system consumes the source event, modifies the data before pushing into the multiple targets. Create Athena table from legacy source data and compare it problematic event forwarder data. If you have not enabled CloudWatch or set up your own ELK stack, but need to analyze service patterns like total HTTP requests by type, 4XX and 5XX errors by call types, this is possible by enabling ELB access logs and reading through Athena. Data must reside in S3. To reduce the cost of the query and improve performance, data must be compressed, partitioned and converted to columnar formats. User-defined functions, stored procedure, and many DDL are not supported. If you are generating data continuously or has large data sets, want to get insights into real-time or frequently you should rely on analytical and visualization tools such as RedShift, Kinesis, EMR, Denodo, Spotfire and Tableau. Check Athena FAQ to understand more about its benefits and limitations. In this post, I shared how to leverage Athena to get analytics and minimize bottlenecks to product delivery. Be aware that some of the methods used were implemented when Athena was new. New tools may have changed how best to solve these use cases. Lately, it has been integrated with Glue for building, maintaining, and running ETL jobs and then QuickSight for visualization. Vijay Yelanji (@VijayYelanji) is an architect at Asurion working at San Mateo, CA. has more than 20+ years of experience across various domains like Cloud enabled Micro Services to support enterprise level Account, File, Order, and Subscription Management Systems, Websphere Integration Servers and Solutions, IBM Enterprise Storage Solutions, Informix Databases, and 4GL tools. In Asurion, he was Instrumental in designing and developing multi-tenant, multi-carrier, highly scalable Backup and Restore Mobile Application using various AWS services. Recently Vijay presented a topic ‘Logging in AWS’ at AWS Meetup, Mountain View, CA. Many thanks to AnanthakrishnaChar, Kashyap and Cathy, Hui for their assistance in fine-tuning some of the use cases. Relational Databases have been the standard way to store information since the 1980s. Relational Database usage techniques such as normalisation and index creation form part of many University courses around the world. In this article, I will set out how perhaps the hardest part of using DynamoDB is forgetting the years of relational database theory most of us have absorbed so fundamentally that it colours every aspect of how we think about storing and retrieving data. Let’s start with a brief overview of DynamoDB. Relation Databases were conceived at a time when storage was the most expensive part of a system. Many of the design decisions revolve around this constraint – normalisation places a great deal of emphasis on only having a single copy of each item of data. NoSQL databases are a more recent development, and have a different target for operation. They were conceived in a world where storage is cheap, and network latency is often the biggest problem, limiting scalability. In reality, whether it lives up to the hype depends on your viewpoint of what each of these concepts mean. The durability, availability, and capacity points are the easiest to agree with – the changes of data loss are infinitesimally low, the only limit on capacity is the 10GB limit per partition, and the number of DynamoDB outages in the last eight years is tiny. As we move down the list though, things get a bit shakier. Scalability depends entirely on sharding data. This means that you can run into issues with ‘hot’ partitions, where particular keys are used much more than others. While Amazon has managed to mitigate this to some extent with adaptive capacity, the problem is still very much something you need to design your data layout to avoid. Simply increasing the provisioned read and write capacity won’t necessarily give you extra performance. It’s kind of true that DynamoDB is schemaless, in that table structures are not uniform, and each row within a table can have different columns of differing types. However, you must define your primary key up front, and this can never change. The primary key consists of at minimum a partition key, and also optionally a range key (also referred to as a sort key). You can add secondary indexes after table creation, but only up to a maximum of 5 local and 5 secondaries. This all adds up to make the last point, that there is no operational overhead when using DynamoDB, obviously false. You won’t spend time upgrading database version or operation systems, but there’s plenty of ops work to do designing the correct table structure, ensuring partition usage is evenly spread, and troubleshooting performance issues. So how do you make your life using DynamoDB as easy as possible? Start by forgetting everything you know about relational databases because almost none of it is true here. Be careful – along the way you’ll find a lot of your instincts about how data should be structured are actually optimisations for RDBMS rather than incontrovertible facts. In DynamoDB, the ‘right’ number of tables to power an application is one. There are of course exceptions but start with the assumption that all data for your application will be in a single table, and move to multiple tables only if really necessary. In a relational database, the structure of your data stems from the data itself. You group and normalise, and then stitch things back together at query time. DynamoDB is different. Here you need to know the queries you’re most commonly going to run to structure your data appropriately and work backwards to come up with the table design. Many times when using DynamoDB you will store the same data more than once. This might even be done with multiple copies of data in the same row, to allow it to be used by different indexes. Global Secondary Indexes are just copies of your data, with different keys. Imagine you have a table with a compound primary key – an account ID as the partition key, and a range key. You could use the range key to store different content about the account, for example, you might have a sort key settings for storing account configuration, then a set of timestamps for actions. You can get all timestamps by executing a query between the start of time and now, and the settings key by specifically looking up the partition key and a sort key named settings. This is probably the hardest part to get your head around at first, but once you get used to it, it becomes very powerful, particularly when used with secondary indexes. This, of course, makes choosing a suitable name for your sort column very difficult. Using this sort key, you can find all items within a partition at any of the hierarchical levels by using a starts-with operator. Because not every row in DynamoDB must have the same columns, you can have secondary indexes that only contain a subset of data. A row will only appear in a secondary index if the primary key for that index exists in the table. Using this, you can make less specific and even scan queries that are efficient enough for frequent usage. With relational databases, it’s common to spin up a read-only replica to interrogate data for analytics and trending. With DynamoDB, you’ll be needing to do this work somewhere else – perhaps even in a relational database. You can use DynamoDB streams to have data sent to S3, for analysis with Athena, Redshift, or even something like MySQL. Doing this allows you to have a best of both worlds approach, with the high throughput and predictable scalability of DynamoDB, and the ability to do ad-hoc queries provided by a relational engine. Sam Bashton is a cloud computing expert who recently relocated with his family from Manchester, UK to Sydney, Australia. Sam has been working with AWS since 2006, providing consultancy and support for high traffic e-commerce websites. Recently Sam wrote and released bucketbridge.cloud, an AWS Marketplace solution providing an FTP and FTPS proxy for S3. Jennifer Davis is a Senior Cloud Advocate at Microsoft. Previously, she was a principal site reliability engineer at RealSelf and developed cookbooks to simplify building and managing infrastructure at Chef. Jennifer is the coauthor of Effective DevOps and speaks about DevOps, tech culture, and monitoring. She also gives tutorials on a variety of technical topics. When she’s not working, she enjoys learning to make things and spending quality time with her family. This article will introduce you to creating serverless PubSub microservices by building a simple Slack based word counting service. These PubSub microservices are AWS Lambda based. Lambda is a service that does not require you to manage servers in order to run code. The high level overview is that you define events ( called triggers ) that will cause a packaging of your code ( called a function ) to be invoked. Inside your package ( aka function ), a specific function within a file ( called a handler ) will be called. There are many different types of triggers ( S3, API Gateway, Kinesis streams, and more). See this page for a complete list. Lambdas run in the context of a specific IAM Role. This means that, in addition to features provided by your language of choice ( python, nodejs, java, scala ), you can call from your Lambda to other AWS Services ( like DynamoDB ). The third service logs the input it receives. While you might not have a specific need for a word counter, the concepts demonstrated here can be applied elsewhere. For example, you may have a project where you need to run several things in series, or perhaps you have a single event that needs to trigger concurrent workflows. New user needs a Google account created, then that Google account needs to be given permission to access another system integrated with Google auth. I came into the world of computing by way of The Operations Path. The Publish-Subscribe Pattern has always been near and dear to my ❤️. There are a few things about PubSub that I really appreciate as an “infrastructure person”. Scalability. In terms of the transport layer ( usually a message bus of some kind ), the ability to scale is separate from the publishers and the consumers. In this wonderful thing which is AWS, we as infrastructure admins can get out of this aspect of the business of running PubSub entirely. Loose Coupling. In the happy path, publishers don’t know anything about what subscribers are doing with the messages they publish. There’s admittedly a little hand-waving here, and folks new to PubSub ( and sometimes those that are experienced ) get rude surprises as messages mutate over time. Asynchronous. This is not necessarily inherent in the PubSub pattern, but it’s the most common implementation that I’ve seen. There’s quite a lot of pressure that can be absent from Dev Teams, Operations Teams, or DevOps Teams when there is no expectation from the business that systems will retain single millisecond response times. New Cloud Ways. Once upon a time, we needed to queue messages in PubSub systems ( and you might you might still have a need for that feature ), but with Lambda, we can also invoke consumers on demand as messages pass through our system. We don’t necessarily hace to keep things in the queue at all. Message appears, processing code runs, everybody’s happy. One of the biggest benefits that we can enjoy from being hosted with AWS is not having to manage stuff. Running your own message bus might be something that separates your business from your competition, but it might also be undifferentiated heavy lifting. IMO, if AWS can and will handle scaling issues for you ( to say nothing of only paying for the transactions that you use ), then it might be the right choice for you to let them take care of that for you. I would also like to point out that running these things without servers isn’t quite the same thing as running them in a traditional setup. I ended up redoing this implementation a few times as I kept finding the rough edges of running things serverless. All were ultimately addressable, but I wanted to keep the complexity of this down somewhat. CloudFormation is pretty well covered by AWS Advent, we’ll configure this little diddy via the AWS console. This Lambda accepts the input from a Slack outgoing webhook, splits the input into separate words, and adds a count of one to each word. It further returns a json response body to the outgoing webhook that displays a message in slack. If the Lambda is triggered with the input awsadvent some words, this Lambda will create the following three keys in dynamodb, and give each the value of one. Setup an outbound webhook in your favorite Slack team. We’re using a SNS Topic as a broker. The producer ( the aws_advent Lambda ) publishes messages to the SNS Topic. Two other Lambdas will be consumers of the SNS Topic, and they’ll get triggered as new messages come into the Topic. This permission will allow the first Lambda to talk to the SNS Topic. 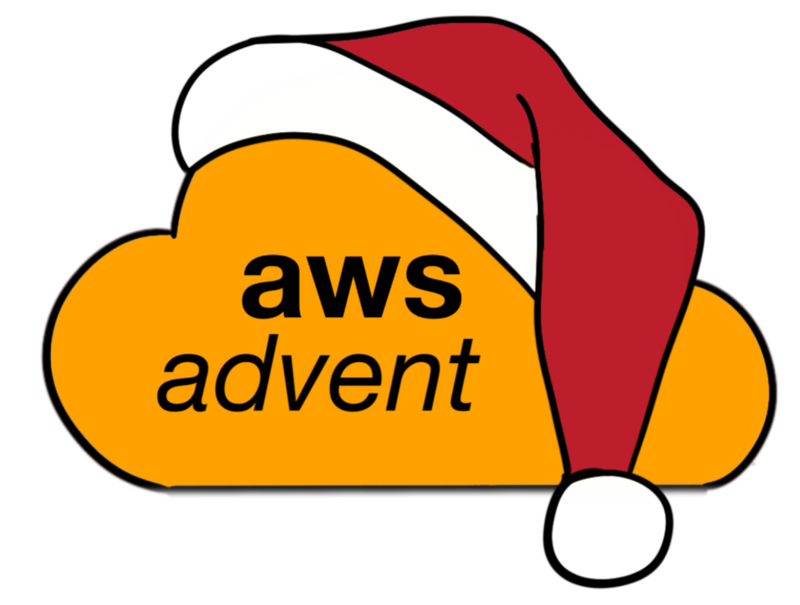 You also need to set an environment variable on the aws_advent Lambda to have it be able to talk to the SNS Topic. There’s a conditional in the aws_advent lambda that will publish to a SNS topic, if the SNS_TOPIC_ARN environment variable is set. Set it, and watch more PubSub magic happen. The SNS Topic ARN from above. This microservice increments the values collected by the aws_advent Lambda. In a real world application, I would probably not take the approach of having a second Lambda function update values in a database that are originally input by another Lambda function. It’s useful here to show how work can be done outside of the Request->Response flow for a request. A less contrived example might be that this Lambda checks for words with high counts, to build a leaderboard of words. This Lambda function will subscribe to the SNS Topic, and it is triggered when a message is delivered to the SNS Topic. In the real world, this Lambda might do something like copy data to a secondary database that internal users can query without impacting the user experience. It’s included as sns_multiplier.py in this repo. Go back to slack and test it out. Now that you have the most interesting parts hooked up together, test it out! The second time we sent a message, the count of the number of times the words are seen is twelve. This is a combination of our first and second Lambdas working together. The first invocation set the count to current(0) + one, and passed the words off to the SNS topic. The value of each word in the database was set to 1. After SNS recieved the message, it ran the sns_multiplier Lambda, which added ten to the value of each word current(1) + 10. The value of each word in the database was set to 11. The second invocation set the count of each word to current(11) + 1. The value of each word in the database was set to 12. This output of this Lambda will be viewable in the CloudWatch Logs console, and it’s only showing that we could do something else ( anything else, even ) with this microservice implementation. It’s included as sns_logger.py in this repo. PubSub is an awsome model for some types of work, and in AWS with Lambda we can work inside this model relatively simply. Plenty of real-word work depends on the PubSub model. You might translate this project to things that you do need to do like software deployment, user account management, building leaderboards, etc. It’s ok to lean on AWS for the heavy lifting. As our word counter becomes more popular, we probably won’t have to do anything at all to scale with traffic. Having our code execute on a request-driven basis is a big win from my point of view. “Serverless” computing is a very interesting development in cloud computing. Look for ways to experiment with it, there are plenty of benefits to it ( other than novelty ). Pay-per-transaction. You don’t have to pay for idle resources! Scaled the lambda invocations to the volume of traffic. Lambda and the API Gateway are works in progress. Lambda is a new technology. If you use it, you will find some rough edges. The API Gateway is a new technology. If you use it, you will find some rough edges. Don’t let that dissuade you from trying them out! Ed Anderson has been working with the internet since the days of gopher and lynx. Ed has worked in healthcare, regional telecom, failed startups, multinational shipping conglomerates, and is currently working at RealSelf.com. Ed is into dadops, devops, and chat bots. Writing in the third person is not Ed’s gift. He’s much more comfortable poking the private cloud bear, destroying ec2 instances, and writing lambda functions be they use case appropriate or not. He can be found on Twitter at @edyesed. Evan Mouzakitis is a Research Engineer at Datadog. He is passionate about solving problems and helping others. He has written about monitoring many popular technologies, including Lambda, OpenStack, Hadoop, and Kafka. Brian O’Rourke is the co-founder of RedisGreen, a highly available and highly instrumented Redis service. He has more than a decade of experience building and scaling systems and happy teams, and has been an active AWS user since S3 was a baby.